This English unit addresses the informative text type; specifically, how to write a well-structured informative text. A 60 minute lesson in which students will identify and explore the structure of informative texts. What is the purpose of informative writing? What is a ‘reliable source’ of information? What text features might you find in an informative text? Discuss the structure of informative texts, as outlined on slide 6 of the Writing Informative Texts PowerPoint. Read through the first example text, The Great T-Rex, on slides 7-9. Subheadings have been added to the text to assist the students in identifying the informative structure. Read through the class activity, as outlined on slide 10. As a class, read through the second example text, Where Does Water Come From?, on slides 11-12. Encourage the students to label the informative structure of the text as they are reading. Discuss the answers on slide 13. Display and discuss the independent activity on slide 14. 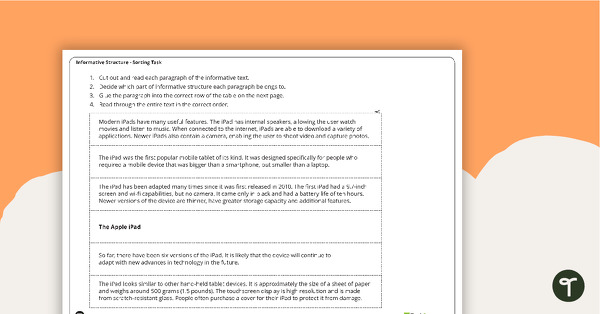 Provide the students with a copy of the Informative Text Structure – Sorting Task. Read through the instructions for the task and answer any questions the students may have. Allow the students to work through the sorting task in small groups or pairs. Monitor and support the students as required. As a class, discuss the correct sequence of the informative text. Discuss any techniques used by the students to help them sequence the text e.g. topic sentences at the beginning of each paragraph. Select a range of goals for the unit from the Goals – Writing (Upper) and discuss these with the students. Allow the students to ask questions about each goal and encourage them to suggest some success criteria for each. Display these goals in an obvious place in the classroom for the duration of the unit. Encourage more capable students to peer tutor others who may need assistance with the sequencing activity. Allow less confident students to be supported by peer tutors, or to work in a smaller group with a teacher or teacher aide. 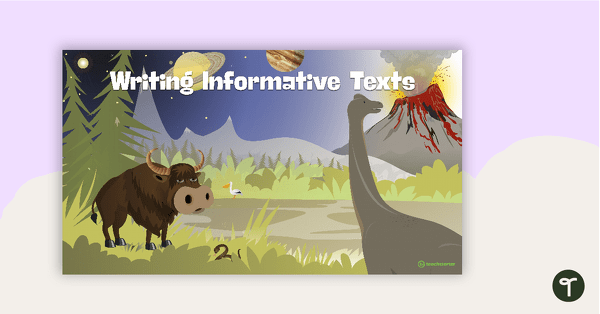 A 19 slide editable PowerPoint template to use when teaching your students about the structure and language features of informative texts. A sorting task to help students learn about informative text structure. 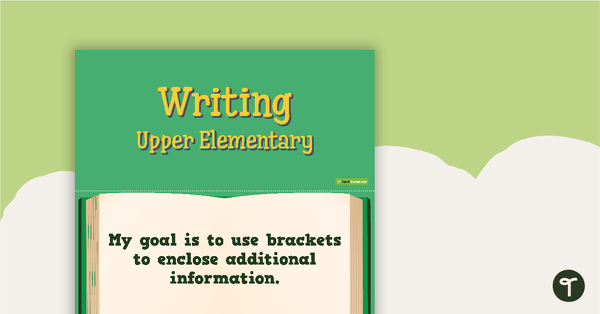 Twenty-five writing goal cards for key stage 2 – upper.